Sketch C Showing the Progress of the Survey in Section III From 1843 to 1852. 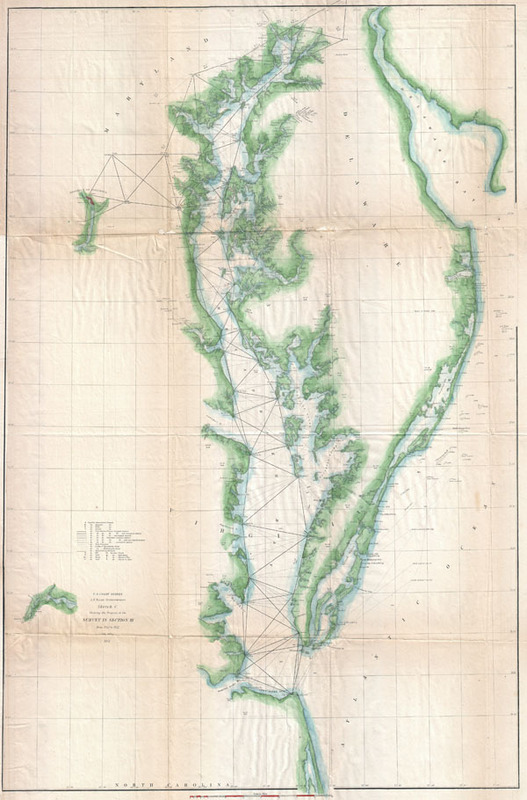 An uncommon U.S. Coast Survey map and triangulation chart of the Chesapeake Bay. Details from the Hampton Roads in the south north to the mouth of the Susquehanna River, extends westward as far as Washington D.C. and eastwards to include Delaware Bay. Names numerous points, lighthouses, and towns along both sides of the Bay and along the Atlantic seaboard. Prepared under the supervision of A.D. Bache, for inclusion in the 1852 edition of the Report of the Superintendant of the U.S. Coast Survey. Good condition. Minor toning and verso repairs along original fold lines. Margin extended along left side. Blank on verso.